Discussion in 'Article Discussion' started by Tim S, 18 Apr 2008.
isn't the top heat pipe getting in the way of the PCI-E card? The Thermalright Ultima 90 (which is by far not the biggest cooler avalaible) just barely fits on my p35 platinum due to the heatpipe "mess"... I hope there will be less cleareance problems with the p45 version. While I appreciate the nostalgia, jumpers have had their place in time. Let them sleep quietly in the past.... such fun memories on my k6-2 motherboard. Although it is nice to see that they at least admit their BIOS is lacking against their competitors. 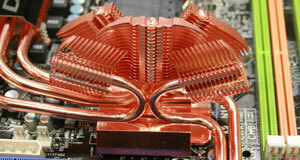 Heatpipes a-go-go! 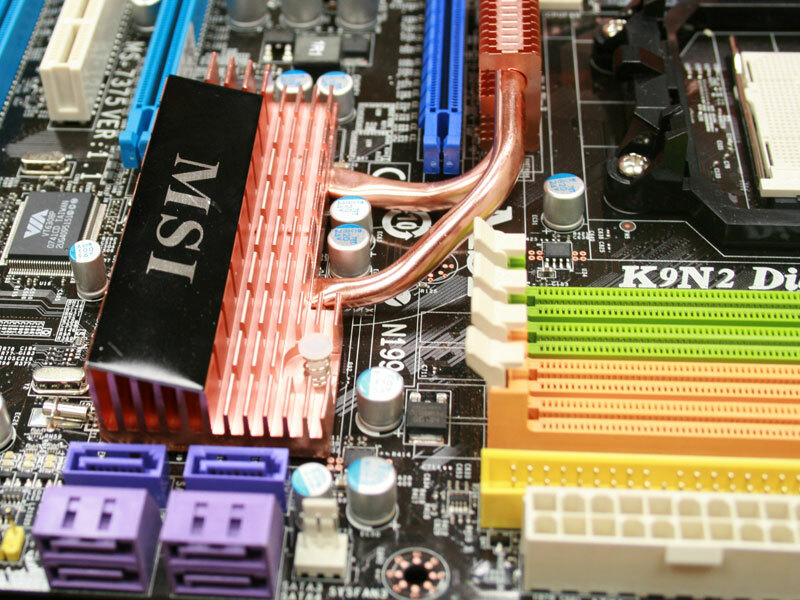 No wonder some motherboards are so dear, the amount of copper included on them these days. Any mention of whether or not the 10GigE port was included on the ICH10R bridge? There's about 0.0001% chance that anyone will be able to use it right now, but it'd be the first example of an affordable 10GigE NIC if it's there! I've been looking into 10GigE/Infiniband hardware lately, so it's currently 'relevent to my interests'. Isnt that a bad thing, you want to dissipate less heat, correct? They mean the chips produce less heat. yes, sorry - bad choice of word. They produce less heat than traditional designs. <- NOT an MSI fan but this: looks great. i am pretty sure those heatpipes are just for show. Maybe its just me, but on the K9A2, putting the pci-e 1x in the middle of the pci-e x16 seems like a bad idea. It would be nice if it had an extra pci-e 1x since they know what you will use that one for... Hopefully they make the SLI connector long enough to make it over their sound card. Stll waiting for a working 'intel' SLI based motherboard. The way things seem to be going between nVidia and Intel – reminds me when Intel and AMD ‘loved’ each other. Unfortunately Intel currently does not support nVidia’s SLI technology and to be honest, don’t see anything on the way. may be Intel wants AMD to be forced into graphics only, and at the same time squeeze nVidia out. Might anyone know the specifics on the BIOS for this board? I'm wondering if the lack of features might be due to MSI focusing on something else, or maybe the BIOS is something different than their BIOS in the past and they don't have all the bells and whistles done yet. Concerning those cryptic options, maybe someone should start a thread on them. They may have to deal with specific hardware functionality and the descriptions make sense, but only if you know the hardware.